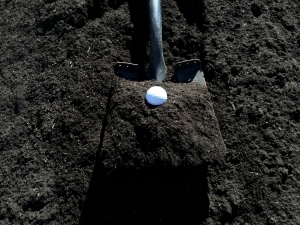 This compost is used in most of our amended topsoil blends. It can be used to to add nutrients to your soil for planting. It is made form decomposed vegetation and equestrian shavings. It is cooked for a minimum of 90 days to kill off any weed seeds or pathogens. If you need to amend your soil use this compost and turn it into your existing soil. For best results do not plant directly into the compost by itself. The compost is meant to be mixed with your native soil. If you looking for something you can plant directly into without needing to turn your soil you will probably be interested in our amended topsoil blends instead.